We’ve been using IFTTT on a near-daily basis since 2014 – and over the course of these past few years, the IFTTT experience has changed quite a bit. So we thought it was time for an update of our own (and maybe a small rant). It’s been our longtime hope that IFTTT would bring more features to its users through a paid subscription plan. Yes, we would happily shell out $10 a month to be able to set up synchronized alerts (for example making lights turn red AND calling my phone if the greenhouse is overheating — currently the only way to accomplish this is to set up multiple instances of the same trigger). Back in 2014, that seemed like a sure thing. IFTTT’s founder, Linden Tibbets, even came right out and said that they were looking towards charging consumers for a premium service in the coming months. He also mentioned opportunities “on the channel side” — which turned out to be the direction IFTTT took. Alas, we never did get the premium subscription we hoped to see. Instead, in February 2016 IFTTT launched a $199/month subscription plan for its service partners. IFTTT also allows applets to run directly from those partner apps now, so users can access a curated selection of applets without ever downloading the IFTTT app. And our hope for synchronized actions? IFTTT can do that now, but only partners have that ability, not consumers. So now BMW has its own applet that makes Garageio open the garage door, turns up the Nest thermostat, and turns on the Philips Hue lights when the car pulls in the driveway – but there’s no way for the user to use different hardware or customize the applet. For consumers wanting to do more with IFTTT, there is another option – the “Maker” channel, released in June 2015. This channel lets users create applets using any device or service that can make or receive a web request. For example, I was able to get IFTTT pulling the data from my Dexcom continuous glucose monitor, and then I set up various alerts for low and high glucose thresholds – calling my phone, turning on lights, putting a notification on the Comcast X1 box, etc. However, the Maker channel still doesn’t allow multiple actions per applet; I had to create separate applets for every trigger/alert combination – which, in addition to being a pain, makes for a long list of applets that need to be updated if you decide to make changes. So how’s that partner subscription working out? In the early days, services were added to IFTTT for free, often with no development work on their part – IFTTT just connected to apps and devices with open APIs. Now that IFTTT is asking services to pay for its platform, some have been vocal about their support for the new IFTTT while others were cut off for refusing to shell out the cash. The founder of social bookmarking service Pinboard even wrote a blog post about why he chose not to sign on, citing “squirrely terms of service” and that IFTTT “wanted him to do their job for them, for free.” Of course, in that same blog post he also compared IFTTT to a sewer pipe, so read into that what you will. When asked in an interview with Fast Company whether Philips was willing to pay for the platform, George Yanni (Head of Connected Technology) was noncommittal at best. He mentioned that he “wasn’t sure how the process would go,” and that Philips has enjoyed a “long, very successful partnership with IFTTT, where we’ve both gotten a lot of value and publicity out of it, so we’ll just have to discuss with them to see how best we do that going forward.” Sounds to us like IFTTT might have a problem getting its most popular services to pony up. When setting up triggers and actions, IFTTT used to have shortcuts to your favorite services, which made it easy to create new recipes – oops! — applets. That top spot has since been replaced with “popular” services, followed by a long list of all available services. This is almost certainly designed to encourage more discovery, but that backfires when the list is so cluttered that it’s easier to use the search box than scroll to what you need. Currently, IFTTT and Automatic are hit or miss – sometimes alerts happen promptly, and sometimes they get stuck and come sailing over the transom several hours later. (This is much like Leslie’s now-rogue doorbell-cam, which now rings more than a half hour AFTER being triggered.) Waking up at 2 a.m. to a notification that my car is halfway across town is an eye-roller, yet I’m always compelled to go make sure it’s still in the driveway. 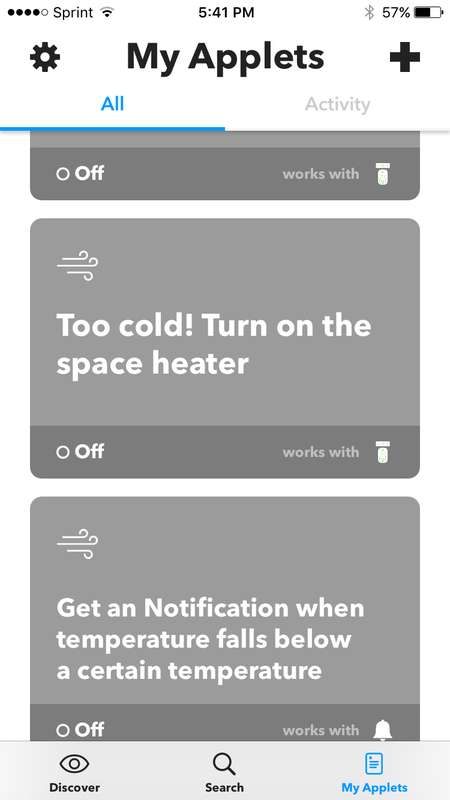 Despite being irritated at the direction IFTTT is going, I still use it every day. In fact, it saved me a lot of pain just this morning, when I awoke at 3:30 a.m. to a phone call from a robotic voice somewhere in the Silicon Valley, warning me that my seedlings were about to freeze. Unbeknownst to me, the circuit powering the greenhouse heater tripped, and the temperature inside the greenhouse was steadily dropping while I slept. If not for the alerts I set up, I surely would have woken to a greenhouse full of frozen tomatoes and peppers. It saved our seedlings last year too. So despite the frustrations, we’ll keep living with IFTTT (at least until something better comes along). 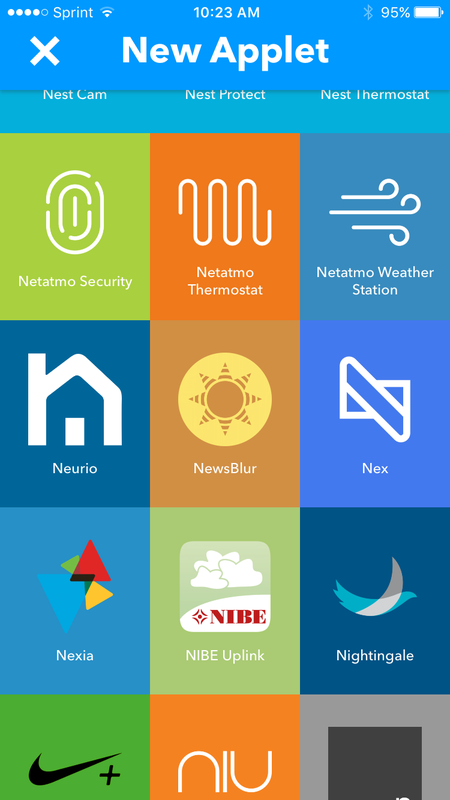 Weird IoT Candidates of Late: More Solutions Seeking a Problem?